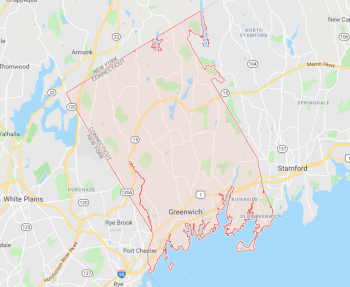 Writing full pages about named rocks in Connecticut is a dicey proposition. Where does one draw the line? I can’t possible write about every named rock. After all, you could name a rock tomorrow just to mess with me. But some named rocks clearly deserve their own pages. 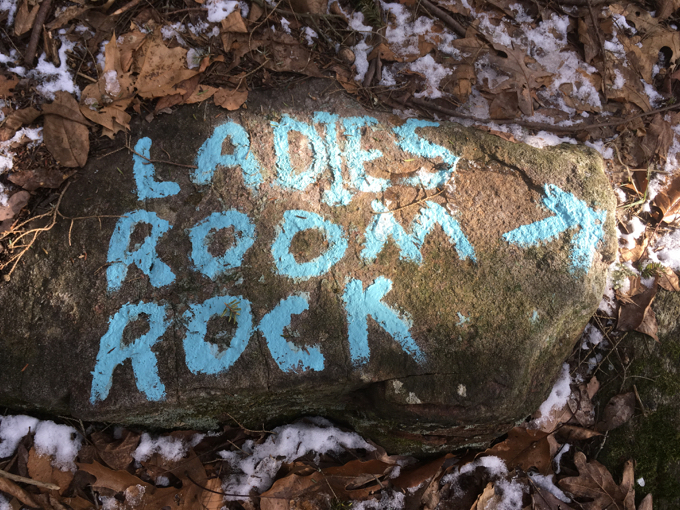 I think we can all agree that Ladies Room Rock deserves the honor. 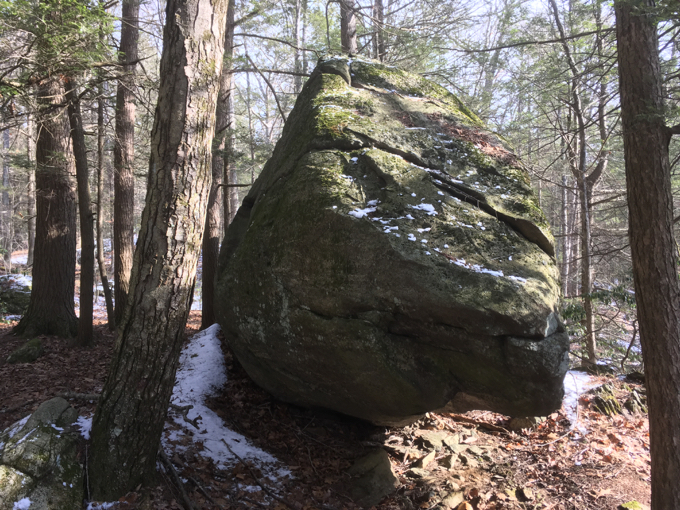 The large glacial erratic sits majestically right beside the Nipmuck Trail in Ashford. It is very close to the northern terminus of the Natchaug Trail too. This is an important rock. 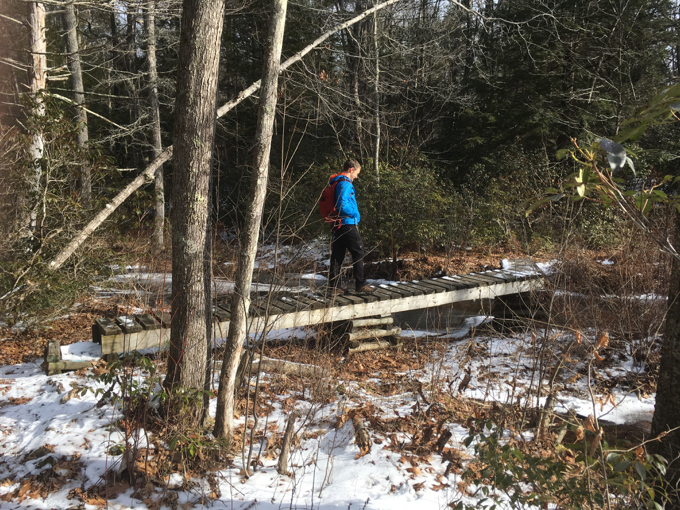 I encountered it during a 12-mile section hike of the Nipmuck with my friend Matt. He had already been to the Ladies Room, so to speak, so he toyed with my emotions as we made our way north. 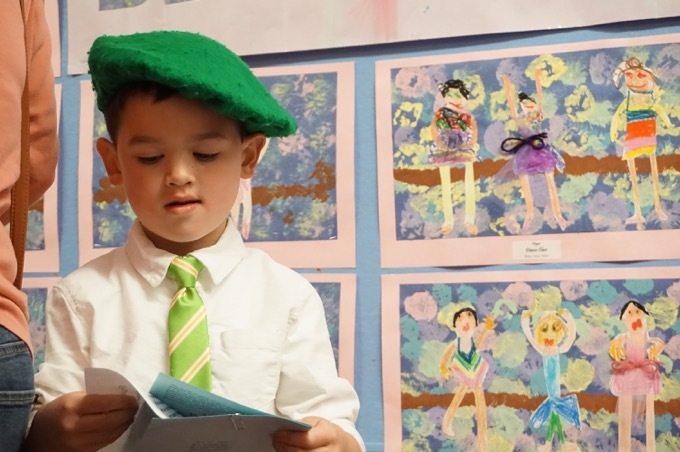 “No, no,” I was assured by a confident Matt. I don’t know what I was expecting. I think I was hoping for a boulder that vaguely resembles a toilet. Instead, I got a Jawa Sandcrawler. 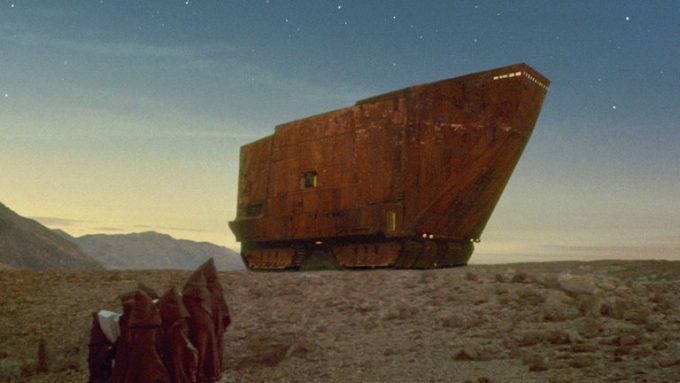 Come to think of it, as excited as I was for Ladies Room Rock, I think I’d have been even moreso for Jawa Sandcrawler Rock. Oh well. Someone helpfully painted a notice on a rock on the trail. Yup. There it is. Ladies Room Rock. Matt wondered why there was no Men’s Room Rock and I helpfully suggested that we, as men, can use any old rock or tree in the woods whenever the need arises. He conceded my point. Once home, I wondered aloud to my wife about the name. “Isn’t it obvious?” she offered. But there are hundreds of rocks in the woods of Ashford that afford this same benefit! And they don’t have painted signs POINTING OUT THE FACT THAT LADIES MAY BE UTILIZING THE BACKSIDE OF THE ROCK AS A BATHROOM. Let’s turn to Peter Marteka. He’s almost as smart as my wife and surely he found a better explanation. 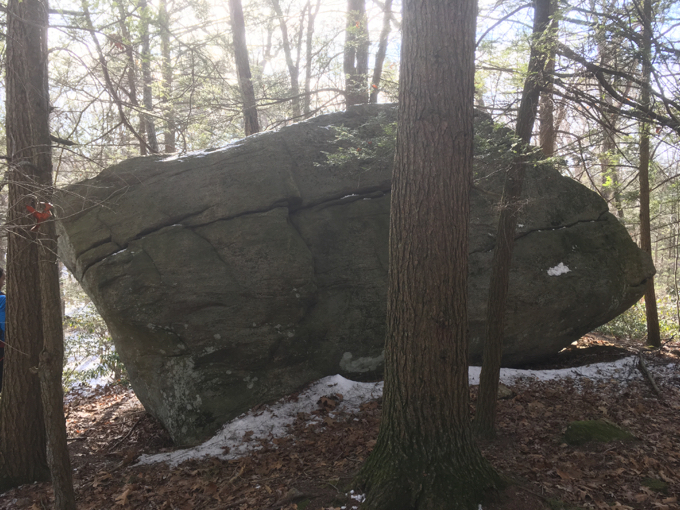 Another “can’t miss” feature along the trail is a rock formation known as “ladies room rock.” The giant, boxy glacial erratic boulder will give plenty of privacy for those who need it. My wife is always right. Happy Valentines Day. Yes, she is. And I’ve never even met the woman! When I first came across it that’s what I assumed it meant. Except that when you’re hiking north you can pretty much see what’s behind the rock as you’re approaching it.